As the Christian doctrine of Incarnation asserts, “the Word became Flesh.” Yet, while this metaphor is grounded in Christian tradition, its varied functions far exceed any purely theological import. It speaks to the nature of God just as much as to the nature of language. 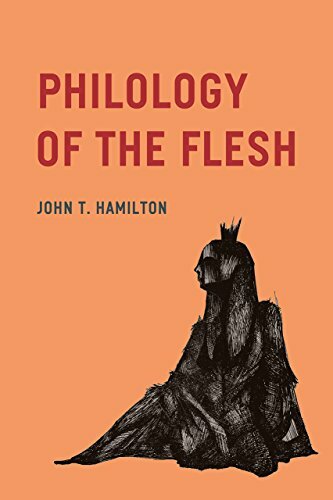 In Philology of the Flesh, John T. Hamilton explores writing and reading practices that engage this notion in a range of poetic enterprises and theoretical reflections. By pressing the notion of philology as “love” (philia) for the “word” (logos), Hamilton’s readings investigate the breadth, depth, and limits of verbal styles that are irreducible to mere information. While a philologist of the body might understand words as corporeal vessels of core meaning, the philologist of the flesh, by focusing on the carnal qualities of language, resists taking words as mere containers. By examining a series of intellectual episodes—from the fifteenth-century Humanism of Lorenzo Valla to the poetry of Emily Dickinson, from Immanuel Kant and Johann Georg Hamann to Friedrich Nietzsche, Franz Kafka, and Paul Celan—Philology of the Flesh considers the far-reaching ramifications of the incarnational metaphor, insisting on the inseparability of form and content, an insistence that allows us to rethink our relation to the concrete languages in which we think and live.